3 Members Ignored SM Deadline, Both Parties Stood Their Ground – What Will Happen to TVXQ? Today is the last day for SM Entertainment and the three members to come to a decision. However, both parties have still failed to do so. The three members of TVXQ (Xiah Junsu, Micky Yoochun and Youngwoong Jaejoong) and SM Entertainment have still not come to a decision. Both sides are standing strong with their choices, not giving in to the other. Thus, the possibility of them reconciling is decreasing each day. Recently during a press conference, SM has requested the three members to come to a decision by the 12th. However, even though the 12th has passed, there is still no news and this has made fans very worried. On the 12th, SM Entertainment and the three members of TVXQ did not release any statements; both are still not giving in to the other party. We’re afraid that we cannot anticipate SM Entertainment and the three reconciling. 19:00 onward, for 4:30 hours. T/N : The FNS Music Festival is an annual music show produced by Fuji Network System and Fuji Television, one of the largest music awards in Japan. The music show is broadcasted every year on the first Wednesday in December, for approx 4 and a half hours. Up to 2008, the ratings for this music show was the No. 1 for commercial broadcasting stations 6 years in a row, the average ratings are 20% plus. For your information, the producer (Kikuchi P) and the staffs (Otogumi) for the FNS MUSIC FESTIVAL and the BOY POP FACTORY are the same. Jaejoong and Yoochun performed at the BOY POP FACTORY 09 ( August 20) this year. So we cannot confirm all the participants. So please look forward to them! I sincerely hope that everyone can perform on stage. T/N Looking into the 2009 HP, 24 artists’ participation has been confirmed. (There were 30 artists/groups participating in 2008.) 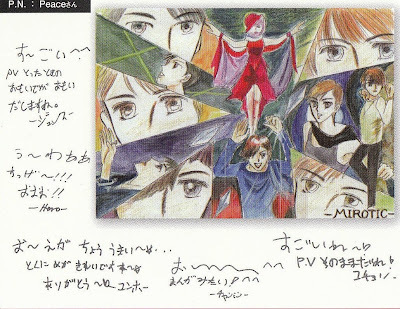 From 2009 HP, I can see the names of avex artists as Ayu, Koda Kumi, Exile, and Girls Next Door on the list, so the PD seems to have a strong contact/relationship with avex. 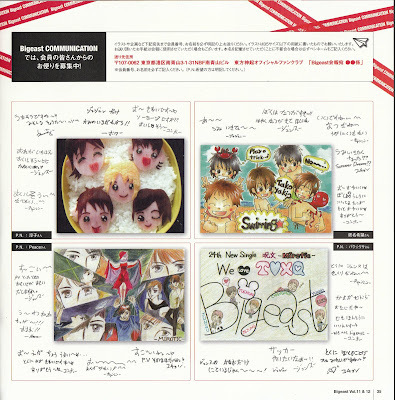 I am sure that there has been talks of Tohoshiki participating, but considering all the uncertain lawsuit…well, let’s keep our fingers crossed for their participation until the last minute! T/N again: Up to this time, I can see 382 comments for this article, almost half of them requesting & longing for Tohoshinki’s participation. SNSD’s Sooyoung, while making an appearance on ‘Y star Exclusive News!’ in the episode of ‘Choi Sujin’, her older sister, showed one by one photos of her childhood. The photos revealed a thin, dark skin, boyish Sooyoung with short hair, which confronted with her present pure and matured image, creating a big issue. During the broadcast, Sooyoung sent a video message to her older sister and musical actress, Choi Sujin, apologizing about not being with her because of her schedule, showing a regretful and anxious heart with her flowing tears. Sooyoung, who is receiving a lot of love by the public with her slim body and height, is currently a MC for MBC’s Fantastic Duo, making her way so that ‘MCing’ can be her speciality. Also, she will show her impressive side as a singer in the upcoming December, 19th and 20th, through SNSD’s first Asia Tour Concert, starting at the Seoul Olympic Stadium, Fencing Arena. GENIA FESTIVAL: TaeYang Will Perform ‘Wedding Dress’ Live on the 15th! Idol group Big Bang member, Taeyang released his single “Wedding Dress” on November 13th. He has been away from the music industry for more than a year, and will be coming back to SBS Inkigayo on Sunday to perform “Wedding Dress” Live for the first time. YG Entertainment announced that Taeyang will be promoting this single until the end of the year. The song which was co-written by YG’s main producer Teddy talks about a man who has to let go of the woman he loves to another man. Teddy has produced many other hits for YG Ent. such as, 2NE1’s “Lollipop”, “I Don’t Care” and his most recent one, “You and I” by Park Bom. Taeyang’s fans are anxiously waiting for this performance, after he left everyone wanting more after his first and only “Where U At“ performance. However fans should be happy now that he will promote all the way until December. Taeyang will be performing this Saturday on SBS Inkigayo at 4:00pm (korean time). 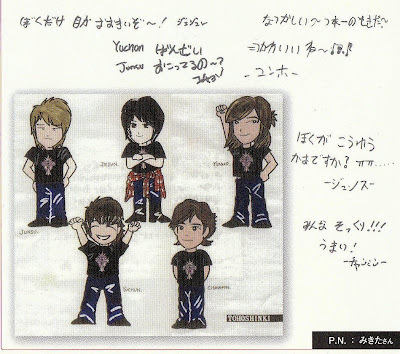 An idol group singer. A joint production between Korea and Japan. Fantasy-romance. The combination of these three elements may make viewers feel unsure about film “Postman to Heaven” at first glance, but it would be too early to make any judgements just yet. Director Lee Byung-hun, actress Han Hyo-joo and boy band TVXQ member Hero Jaejoong turned up at a press screening on Monday for “Postman”, the second of the telecinema projects where a Korean director, Japanese screenwriter and Hallyu stars have gotten together to produce a total of eight films. In “Postman”, Hero plays Jae-joon, the postman from heaven, who delivers letters living people have written to their loved ones in heaven. He comes across Hana, played by Han, who writes a letter full of resentment to the dead man that she used to love, reveals his presence to her, and the two start writing responses to the letters for the saddened people who are left in the real world. Below are excerpts from the press conference held after a screening for the film, set for release on November 11, which waited a year for its showing to the world. 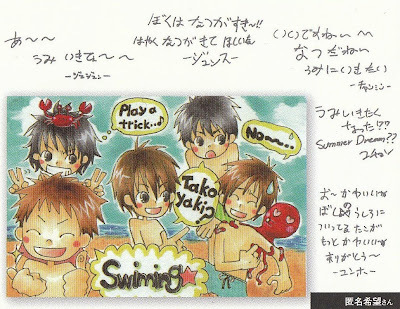 Q: We heard that Erika Kitakawa started writing “Postman to Heaven” with Hero in mind. Why do you think that is? And is there anything the writer or director requested for in particular to you Hero? Director Lee Hyung-min (Lee): Since the telecinemas are a joint project between Korea and Japan, we thought Hero who is widely known as a member of TVXQ, would be good for the part considering the fact the movie would be shown in Japan too. I actually didn’t even know who TVXQ was but I now know the names of all the members. (laugh) And during filming, I realized why the screenwriter wanted Hero to play the part. We were in shoot for over a term of four weeks and during that time, Hero would perform in Asia but come to set right after he got off the plane to practice and shoot his scenes. His acting was good although it was his first time and he would have been done a better job if he had been able to just focus on the movie. Q: Were you able to feel any differences between Korean scripts and one written by a Japanese writer? Han Hyo-joo (Han): When I first got the script, there were parts I didn’t quite understand or lines that didn’t make sense to me. There were also parts I wasn’t too sure about so in the beginning, I got the original script in Japanese and looked it over alongside the one in Korean and studied both. I ended up just going with how I felt but it was good because it was a different experience. Hero Jaejoong (Hero): I got the Korean script first which had been translated from Japanese but I didn’t really understand it because it was my first time acting and I didn’t know how I should analyze it. But director Lee said he wanted to go with the lines that the writer had originally written rather than change them so he helped me to study and practice many of the lines which had difficult nuances. Lee: These two are good at Japanese but I don’t know the language. So when it became difficult for me to catch the emotions the script was trying to display at certain points, we all studied and worked together on those scenes. Q: There were some slightly corny lines toward the latter half of the movie. How did it feel and did you make any bloopers doing the scenes? Q: Director Lee, the imagery you had shown us so far in your previous works, shone again in “Postman”. Is there anything you payed close attention to in particular? Lee: Japanese people have dealt a lot with the topics such as life and death and love stories between the living and the dead in their movies. But Korean people aren’t used to the genre so I had to change some of the script after consulting with the writer. And I because of those parts which may seem awkward to the Korean audience, I felt that it should be more attractive in terms of imagery compared to any other film and got together the best staff in broadcasting, filming and television commercials. I had the TV commercial team work on the filming and lights, the broadcasting team on the editing and producing and the movie staff on the art while paying a lot of attention to mise-en-scene or images. There are parts where the film may seem Japanese but the younger generation these days seem to take in such props, designs and colors quite naturally. I wanted to bring this out as best as I could. Q: Was there any pressure in having to act with Hero who is a newcomer? Han: It’s true that I was very pressured but it gradually lessened and had completely disappeared by the time we were done shooting. I actually had fun while in shoot because Hero’s staff and fans were very considerate towards me. As his acting partner, I would have to say he very quick. His reactions toward my acting was very good and he adjusted pretty quickly so I think he has much potential for the future. Q: Are you considering to continue to act? And you’re currently in a dispute with your agency SM Entertainment over your contract so we are wondering if you plan to continuing to use the name they gave you — Hero Jaejoong? Hero: I’m not the one who put the name “Hero Jaejoong” in the poster so I’m not so sure about that part. (laugh) And I can’t tell you as of now, whether I’ll continue acting or not but I think it would be most right to say, like I have been saying since my debut, that I will try my best if given the opportunity. Q: What is a new sort of joy you felt while acting, different from going up on stage to give performances like you have been doing so for the past several years? Hero: They joy I feel on stage performing versus acting are very different but it took me a long time to catch what it was. The director had actually told me many times to think of acting the same as going up on stage to put on a performance. And he took singer Rain as an example, saying he had become a better performer on stage after taking on acting. Q: What advice did you receive from other members of your group, including U-Know Yunho who recently starred in MBC TV series “No Limit”? Or since you had actually filmed your movie before U-Know went into shoot, had you given him any advice? Hero: They didn’t give me any advice. (laugh) We were all extremely busy back when I was filming “Postman” because we were promoting our fourth album. We also had concerts so everyone was exhausted but U-Know and Max Changmin showed a lot of interest in the atmosphere on set and told me to work hard. And U-Know is such a hard-worker that I wasn’t in a position to give him advice on acting. He never even tells us when he’s having a hard time or he is sick so I just watched how he did, believing he would do well. Lee: I am really thankful to Han. She had just seemed like a younger sibling who doesn’t know anything when she first debuted in “Spring Waltz”. I know she must have been worried over having to act opposite a newcomer but she didn’t hesitate to take on the role. She cut her hair for the first time ever for his film and I’m glad fans of TV series “Shining Inheritance” liked her for her hair too. (laugh) I also congratulate her for being cast as the heroine for producer Lee Byung-hoon’s “Dong Yi”. Regarding Hero, I know the reporters will be tough on him but I’m also tough when it comes to acting. I want to say that he worked really hard and did very well despite it being his first try at acting. 10: Would you like to say a word to your fans who are worried over the legal dispute? Hero: It was actually hard for me even having to show up publicly during such times. But I thought that I really should attend this screening event. I had a very hard time while we were in shoot for this a year ago but I was also very happy during that time and became very close to the director, actors and staff. I myself had been looking forward to its release for the past year so I am in hard times but I thought that I should turn up to congratulate the film. I know a lot of fans must be worried but I hope this movie can be reassurance to their hearts at least a bit. 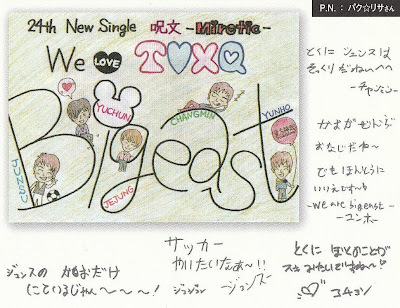 Note: This is the Bigeast COMMUNICATION, introducing letters and illustration from the fans. 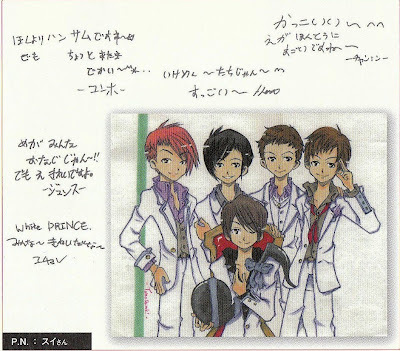 Members’ handwritten comments are written in Japanese. For each comments, starting from the top are: Japanese Hiragana (and Kanji) charancters, Romaji, and English translations. 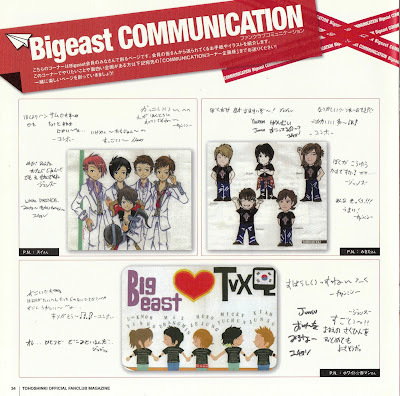 Note: This is again the Bigeast COMMUNICATION, introducing letters and illustration from the fans. 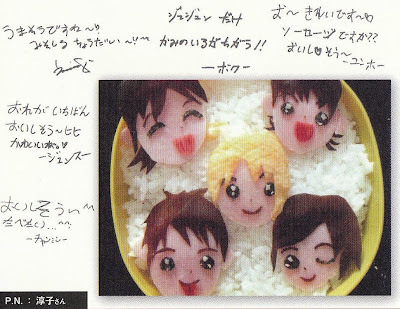 Members’ handwritten comments are written in Japanese. For each comments, starting from the top are: Japanese Hiragana (and Katakana) charancters, Romaji, and English translations.